24 April - Under hazy skies it was the warmest day of the year with the temperature passing 20C after a cold start of below 4C this morning. but under the Birch tree there is a touch of blue and white where the first Bluebells have opened. 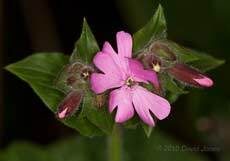 Today, there was the opening of the first of many Red Campions that will colour the garden pink this summer. 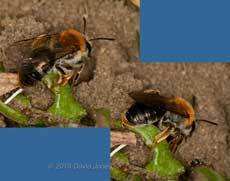 Back on the 17th I mentioned that a solitary bee had been burrowing in the ground between the side of the big pond and the path. Over the last few days I've been checking on it and it appears to have been abandoned. 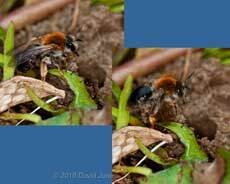 However, yesterday a new burrow appeared a few centimetres away and today I watched out for the bee responsible, which turned out to be a Andrena haemorrhoa, one of the mining bees. and each time the bee returned it was attacked. Here, an ant has attacked the ends of the bee's legs. After a few attempts to approach the burrow, the bee disappeared and I didn't see it again over the next hour. While I waited for it to reappear, I had my one chance today to confirm that the Carder Bumblebee is still using its moss nest - it returned and headed straight in. That saves me setting up the camera for the moment, although I may reconsider it later, perhaps I see workers appearing. 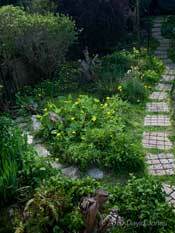 27 April - A beautiful day, sunny and warm, with it registering 20C in the garden at mid-day. There was another first for the garden, or at least the skies overhead, just before noon when I looked up just as a Red Kite flew over, high, and heading south. Fortunately, on this occasion I had the big lens at hand and grabbed this picture of it before it faded into the haze. 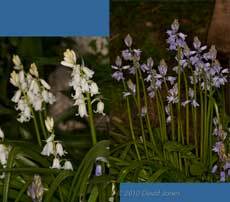 The main picture shows the full frame, and to the right the same image cropped and enlarged. 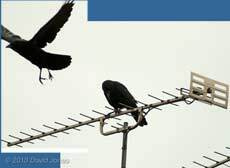 The insert to the left is a portion of another image showing one of a group of six Swifts that appeared overhead shortly after the red Kite's flypast. On the basis that a Swift's wingspan of (40-44cm) is around a quarter of that of the Kite (140-165cm) the Swifts appear to have been at a similar altitude. 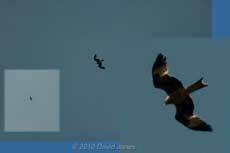 That is only the second time that I've seen a Red Kite - the first time was last June when we were in Cornwall and I had a really close encounter but with no camera! I have a bit of catching up to do to add the large pictures for the last few entries. I hope to make a start on this later in the day now that I've split the page (which had become too long). 30 April - After a week when we have been treated to daytime temperatures sometimes exceeding 20C, the month is ending a bit cooler. This morning it is sunny and 12C outside with the forecast suggesting that it will not get any warmer today. There were a few spots of rain yesterday afternoon before the clouds broke up for the evening, and there was a bit more rain overnight. The ponds could do with more, and the forecast is for that rain to come as we start May. 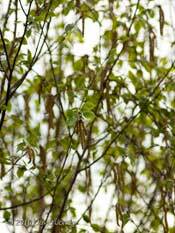 In the garden, the most striking change over the last few days has affected the Birch tree which now gaining its green canopy quite quickly as its spent male catkins start to litter the path below it. 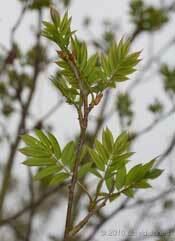 And as the Rowan too gains its canopy, most of its early leaves have now shed the last remnants of their red bud 'caps'. The next thing to look for will be its flower buds - no sign of them as yet. On the Hawthorn and the Elder the flower buds are still tightly closed this morning. Down at ground level the complexion of the garden is beginning to change as more of the Bluebells and Red Campions open, and yesterday there were a couple more first flowerings. 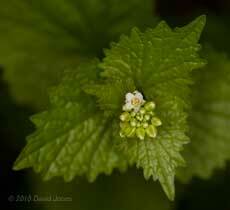 and almost a month later than in 2009, the first tiny Garlic Mustard flower opened. By mid-April last year we had a dense patch of tall Garlic Mustards in front of the workshop shed, but at the moment there are just a couple of tall plants (with this flower on one of them), but lots of seedlings. I haven't taken any insect pictures over the last few days because I've been distracted by other things. The wasps seem to have stopped collecting water for the moment. Does this reflect a pause in their nesting? 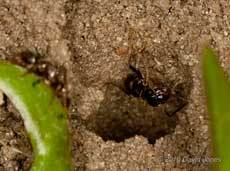 There is quite a bit of solitary bee activity around the bee hotels, but the holes I found in the ground appear to have been abandoned - I guess the ants were responsible for that. In contrast, the Carder Bumblebee is still active in her moss nest. I need to do a bit of careful trimming of the plants that are forming a canopy over the nest entrance. I have only seen a few butterflies these last few days. Two days ago a Speckled Wood spent a short time fluttering around on our veranda, and yesterday I saw a male Orange-tip here again. It looks as though the Blackbirds have had to start another nest. Two days ago the male's alarm call had be heading down the garden just as a Magpie headed into the Ivy tree. Perhaps I got there too late, or it returned later, but yesterday evening I saw the female Blackbird gathering nesting materials again, this time taking them into the conifers beyond the bottom of the garden. 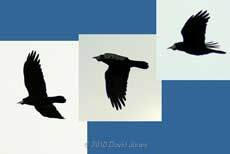 Rooks are a regular sight overhead now and although I have never seen one come down into our garden they are visitors to other gardens along our road. This one was perched above one of the houses that has one of my Swift boxes. My reactions weren't quite quick enough when it decided to fly, hence the cropped wing! I don't know where they are nesting, but it must be somewhere to the north of us as they are always heading to or from that direction. This one was heading north while I was Swift spotting yesterday evening. 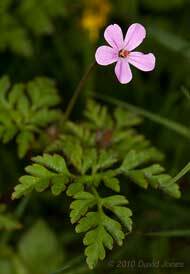 Notice how its crop is bulging - it must have chicks to feed. I've been a bit surprised that I haven't seen any Sparrowhawk visits (attacks) this Spring so far, and I have only seen one high overhead a couple of times. I knew that I shouldn't have said that - late this afternoon I looked out of our bedroom window just in time to see a Sparrowhawk take off from the ground just beyond the big pond. To my surprise it was followed up by a Magpie. Assuming that the hawk had been eating a catch on the ground I took a look at the area and found no feathers or any other sign of why the two birds had been down. Neither had anything visible in their beaks as they left the garden - could they have been visiting the pond to drink or bathe? We are waiting for an addition to the family in the form of a second grandchild. It's birth is already overdue and will happen sometime this weekend. Consequently there may be a gap in the diary which could last for a couple of days.